Creates a new text editor. 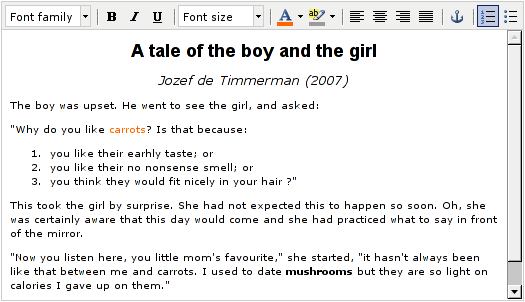 The editor provides interactive editing of XHTML text. By default it provides basic mark-up (font, formatting, color, links, and lists), but additional buttons may be added to the tool bars that add additional formatting options. The implementation is based on TinyMCE. The widget may be configured and tailored using the setConfigurationSetting() and related methods that provide direct access to the underlying TinyMCE component. You can use this widget with TinyMCE version 3 or 4, but this requires different configurations. By default, Wt assumes a 3.x version of TinyMCE. You need to download TinyMCE (version 3.5b1 or later) and deploy the tinymce/jscripts/tiny_mce folder to tinyMCEBaseURL. The default value for tinyMCEBaseURL is resourcesURL/tiny_mce, where resourcesURL is the configuration property that locates the Wt resources/ folder (i.e., we assume by default that you copy the tiny_mce folder to the resources/ folder), see also deployment and resources. If you prefer to use TinyMCE 4 (or later) instead, you'll need to set the tinyMCEVersion property to 4 (or later). Note that TinyMCE changed its folder layout in version 4. You will need to deploy the js/tinymce folder to tinyMCEBaseURL. The default value for tinyMCEBaseURL for TinyMCE 4 (or later) is is resourcesURL/tinymce (i.e., we assume by default that you copy the tiny_mce folder to the resources/ folder). Because the default folder names are different ("tiny_mce" for version 3 versus "tinymce" for version 4, you can have the resources for TinyMCE3 and TinyMCE4 alongside each other while experimenting with the old and new TinyMCE). The default location for the TinyMCE resources may be overridden by configuring the tinyMCEBaseURL property in your Wt configuration file, see configuration properties. Creates a new text editor and initialize with given text. The text should be valid XHTML. Returns a TinyMCE configuration setting's value. An empty Any is returned when no value could be found for the provided argument. The widget itself will also define a number of configuration settings and these may be overridden using this method. Wt loads by default only the plugin 'safari' (which adds support for the Safari web browser). Use this method to load additional plugins. Multiple plugins may be specified as a comma separated list. The various plugins are described in the TinyMCE documentation. Plugins can only be loaded before the initial display of the widget. This method is not supported on WTextEdit and will thrown an exception instead. Sets the stylesheet for displaying the content. The content is rendered using the rules defined in this stylesheet. The stylesheet is also used to derive additional styles that are available in the text editor, for example in the "styleselect" button. Multiple stylesheets may be specified as a comma separated list. This configures the buttons for the i'th tool bar (with 0 <= i <= 3). The syntax and available buttons is documented in the TinyMCE documentation. The default config for the first tool bar (i = 0) is: "fontselect, |, bold, italic, underline, |, fontsizeselect, |, forecolor, backcolor, |, justifyleft, justifycenter, justifyright, justifyfull, |, anchor, |, numlist, bullist". By default, the other three tool bars are disabled (config = ""). The syntax and available buttons is documented in the TinyMCEdocumentation. The default config for the first tool bar (i = 0) is: "undo redo | styleselect | bold italic | link". Some buttons are only available after loading extra plugins using setExtraPlugins(). The tool bar configuration can only be set before the initial display of the widget. Returns a tool bar configuration. This returns the configured version of TinyMCE (currently 3 or 4).